Greater Manchester Police have unveiled a new rainbow-themed patrol car, as part of a bid to tackle hate crime reporting. 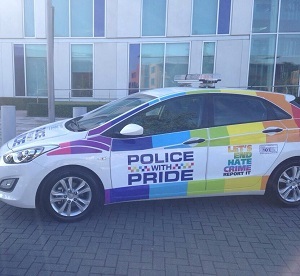 To celebrate the city’s gay community, a new police Hyundai has been decked out with a rainbow decal along the side, and bears the statement: “Police with Pride”. Labour Police and Crime Commissioner Tony Lloyd said: “I am very proud that Greater Manchester Police takes such a visible role at Manchester Pride. “It sends an important message to Greater Manchester and the world that the service is committed to equality and supports the rights of lesbian, gay, bisexual and trans people. “Decking a police car out in rainbow colours isn’t just a colourful statement – it’s a bold one. David Allison of LGB group OutRage! told the Mail: “It may be a bit tacky from an aesthetic point of view. “At least it will draw attention to a police car in a particular vicinity, so it will heighten visibility which will help deter potential wrongdoers, but I can’t see it going further than that. “If it is indicating that police are trying to take the issue more seriously, and this is their PR way of advertising that, then fair enough.